Most of the energy that is consumed in commercial and Sme buildings like multi-tenant office buildings, cloth stores, hotels and restaurants, is for Heating and Cooling applications (almost 25% of the Ontario’s greenhouse gas emissions). The vast majority of this energy is either produced by the combustion of expensive, imported fossil fuels locally or from electricity overloading the electricity grid. 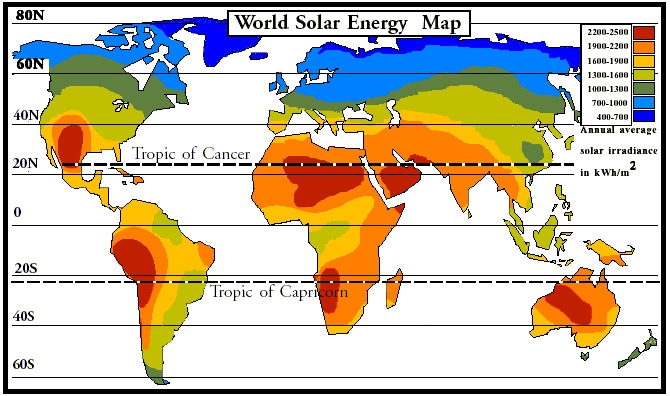 As a result, the cost of Heating & Cooling is very high, with an upward trend, with a very negative impact on the environment in terms of Greenhouse Gas Emissions, smoke inside the cities, and an overloaded expensive and scarce electricity grid.Solar energy is an abundant source of energy available everywhere in massive quantities. LIGHTHOUSE SOLAR COLLECTOR (LSC) uses Fresnel lenses, solar tracking and point focus to concentrate the solar energy and collect it in the form of High-Temperature Thermal energy, with great efficiency, in a practical and cost-effective way, with a payback period of fewer than 5 years without government subsidy. LSC can provide the thermal energy that the Absorption Chillers need to produce Heating & Cooling for the commercial SME building. During the night or in rainy and cloudy days, Biofuels can be used as "stored" solar energy, to provide the Absorption Chillers the energy they need. 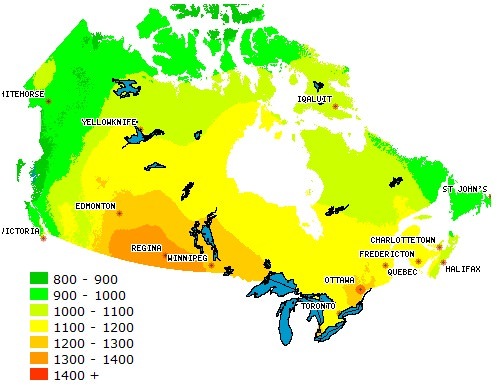 As is it evident in the following maps, the sun radiation in the area of Ontario, is enough to justify a solar installation (average solar radiation. Moreover, using both Geothermal and a solar thermal can provide huge benefits especially in Northern Climates. When building a geothermal loop, adding an extra single run for solar thermal can give the geothermal loop and added boost. The solar thermal will add heat back to the ground for the geothermal loop to pick up. In the summer this is also an ideal dump zone to dissipate the excess heat energy of the solar thermal and store it in the ground warming your earth for the winter months. There are two main drives that will lead the SME's to renewable energy, and both are related to profitability and competitiveness. First using a renewable solution like LSC, that can reduce their cost of energy by up to 60%, in a practical and cost-efficient way, with a very short payback period, there will be a positive margin in their profitability, that they can use either for a reduction in the selling price of their products or for expansion etc. Second, the consumers are becoming very aware of the Climate Change and increasingly they prefer products from businesses that are “Green” using sustainable solutions. For example, according to Booking.com, 65% of the travelers would prefer a “Green” hotel. As a result adopting sustainable practices and renewable energy solutions will help the SME’s retain the market share or even more increase it. Lighthouse Solar Collector addresses the above by substituting the expensive fossil fuels and electricity that they use now with Solar Energy in a cost-efficient way, and help the SME’s to have a “Green” character in the best possible way (bigger impact from other solutions). LSC also is very easy to be installed and operated with an online monitor and control interface, from where the user can see the renewable energy production and the good operation of the installation. This data can be used from the SME, to be assured about the value of the investment, and to communicate it to its customers, stakeholders etc. Lighthouse Solar Collector project is at TRL7 (full-scale prototype tested in the Hellenic Center for Scientific Research "Demokritos" in Athens Greece). According to the results, the prototype has shown better results than competitive solutions, and a substitution of up to 60% of the fossil fuel with Solar Energy, in high temp applications possible. Demonstration installations of LSC on commercial and SME buildings connected to Absorption Chillers and Geothermal pumps where possible, to provide the Heating & Cooling needed and use of Biofuels as auxiliary fuel and energy storage, are the actions we propose. - We are able to make pilot applications of the Lighthouse Solar Systems as well are to design and implement new supplementary solutions like the combined use of Solar and Geothermal energy. Christos Drongitis (proposal author) is the inventor and the leading developer of the LSC project. in case of funding, he will lead the pilot installations in the area of Ontario. - From the other side, the SME's must adopt and invest in the Lighthouse Solar Collector, that has the shortest payback period (based on the current fossil fuel prices). - Moreover, local subcontractors in the production as well as in the installation will take part in the necessary actions. LSC is the best solution to get the maximum energy out of the available roof space of the buildings of SME's and provide energy at the local distributed level. Any building in the area of Ontario (inside or outside cities) with available flat roof space that needs Heating & Cooling is a good installation site for LSC. LIGHTHEAT team has the capacity to design and develop a pilot installation in the area of Ontario, given the funding. The cost of the pilot installation will be higher than the commercially available solution to be developed, mainly because of the small production size (solar collectors will be manufactured only for the pilot installation). Moreover, the distance between the motherland of the team Greece and Ontario will add some traveling costs. Another challenge will be to find subcontractors in Ontario that will manufacture the metallic bulky parts of the LSC in Ontario. The other equipment needed can be sent. Also, a subcontractor that will do the manufacturing must be found as well as installation and service subcontractor. The above challenges can be worked and overcome at the same time that the system will be fine-tuned designed to meet the needs and specifications of the Ontario and the SME that will accept the pilot installation. Also, a challenge will be to find the SME that will adopt the solution but given the funding, it will be much easier. An outcome of the HORIZON2020 SME Instrument Phase I a complete Feasibility study is available to anyone may be interested. In order to be forwarded to other users/companies, the cloud data from the pilot and other installations will be used to reassure the new users of the efficiency and effectiveness of LSC. It is very important for a new product as LSC, that opens a new market, the high-temperature solar collectors for small to medium size installations at the local distributed level, to be able to prove it's production and it's good operation. For this reason as well as for controlling and malfunction prediction purposes, LSC is equipped with sensors on critical components connected to the internet. Specially designed web or mobile applications will show, in easy to understand terms the production and the good operation of the system. This way the new and any user can be easily assured about the value of the investment and the payback period. Lighthouse Solar Collector in contrary to other renewable solutions like photovoltaics, has a very small energy footprint and recyclable more than 90%. A negative result from its wide use it is not expected (photovoltaics in global terms have not yet produced the energy that was consumed to be produced). Moreover, LSC is quite easy to be manufactured and does not need any special industrial infrastructure to be developed. As a result, negative results are not expected a problem in its wide production and use. From the other side, the fossil fuels are getting more expensive all the time and the Climate Change worse every year. It is expected that such high-efficiency renewable systems for small to medium size installation at the local level that increase the energy efficiency of the buildings will be massively subsidized by the Governments. So it is going to be much easier for businesses to adopt such solutions. Finally most commercial and SME's buildings have flat roofs that are available for the LSC installation, making the solar renewable solution the easiest to adopt and use renewable solution. A more detailed market research in the area of Ontario is needed to determine the number of businesses can potentially be affected by LSC. From market researches that we have done in Europe, the number of buildings and business affected can be hundreds of thousands (our first target market will be the hotel in Greece that sum up to 2.500). The business model is a knowledge and marketing intensive rather than a capital-intensive one. Based on that third-party manufacturers and subcontractors for the construction of the metallic, bulky parts of the LSC. There are numerous manufacturers that can produce the metallic parts of LSC in competitive prices and with high quality. Such production requires heavy, expensive machinery with highly specialized personnel. To develop such a production within the company, would take long with high cost and questionable quality. Using third parties manufacturers expansion in different countries with scalable production is very ease with low cost and high quality production. Moreover, this parts that their production will be subcontracted is of low Intellectual Property (IP) value and do not jeopardize our IP capital. Inside the company is kept the R&D, the Operations, the Marketing, the Sales, the assembly and the installation/service (assembly, installation, and service may be also subcontracted if and when needed in order to support fast expansion). service contracts. Because of the great reduction in the cost of fuels in the hotels, the cost of the service contracts will not be noteworthy and will be preferred and can be counted as a repeated sales income. Income will be generated from the sales of LSC, the installation, and the service contracts. Because of the great reduction in the cost of fuels in the hotels, the cost of the service contracts will not be noteworthy and will be preferred and can be counted as a repeated sales income. With such an installation of four 2 sqm LSC, we could substitute 60% (12960 kW) of these fuels with solar energy namely 41.4 Cubic feet of natural gas every year per 100 sqm of the building. Cheaper energy for H&C households. Concentrated Solar Energy in a new practical and cost efficient way.